Durga Pooja is an iconic perception of victory of good over the evil. Durga, the beautiful, but fierce goddess rides her mount of the lion, killing the demon Mahishasura. In each of her ten hands she holds one of the god’s special weapons like Vishnu’s discus, Shiva’s trident, Varuna’s conch shell, Agni’s flaming dart, Vayu’s bow, Surya’s quiver, Indra’s thunderbolt, Kuber’s club, a garland of snakes from Shesha, and as a charger a lion from the Himalayas. A fierce battle raged between Durga and Mahishasura, but finally she killed him with a spear. 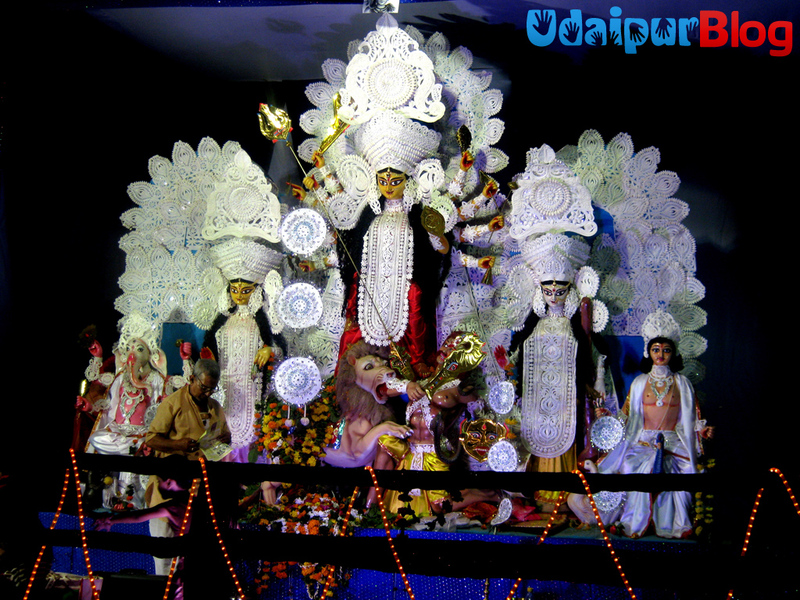 The Durga Pooja is celebrated by the Bengali community and is the grandest festival of the community, celebrated with great excitement and festivity and huge puja pavillions, with ten-armed Durga, are set up. It is a spectacular view and environment all around with the continuous thump of “Dhaki” and blow of “Shankh”. The celebration fever begins from the day before the navratri, known as “Mahalaya”. But, it is celebrated for four days from “Shashti”(6th day) to “Navmi” (9th day) and the grand “Visarjan” on the 10th day or Vijaya Dashmi. 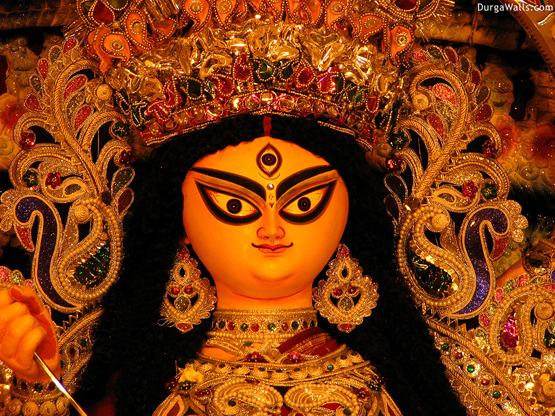 It is believed that the Goddess comes to her “Maayka” for these four days. Udaipur celebrates Durga Pooja with great zeal and vigour with the people who started this festival in Udaipur, who are the Bengalis and have settled in Udaipur before many years and since then is followed by the next generations. 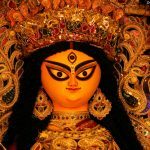 Every Year the artisans and greatly skilled craftsmen and sculptors are called from Bengal who carve out the Goddess’ idol, which is established and worshipped. The day is devoted to the “Pushpanjali” and worship and evening plays out with the staging of cultural programmes after the “Sandhya Aarti” and the famous “Dhunuchi Dance”. Bindu Bhavan: Durga Pooja ceremony was first started at Udaipur by late Shri Nripendralal Bhattacharya, at Bindu Bhawan, 49,Shastri Marg, Udaipur, in the year 1956. Since then it is being celebrated there every year with spirits of great enthusiasm, zeal, and spirituality, and the culture is inherited by generations. Bang Samaaj :- Durga Pooja is being celebrated here since the last successful 49 years. It was started at the famous Chatterjee Bungalow for few years, then shifted to Durga Mandir for two years, then to Maharashtra Bhawan for next two years, and now it is celebrated from many years at the Bang Bhawan in Bhupalpura. Bengali Kalibari Society :- Celebrates Durga Pooja since 1992 at Hiran Magri, the venue recently shifted to Brahmin Samaj Seva Samiti, Hiran Magri sec.4 since 2006. 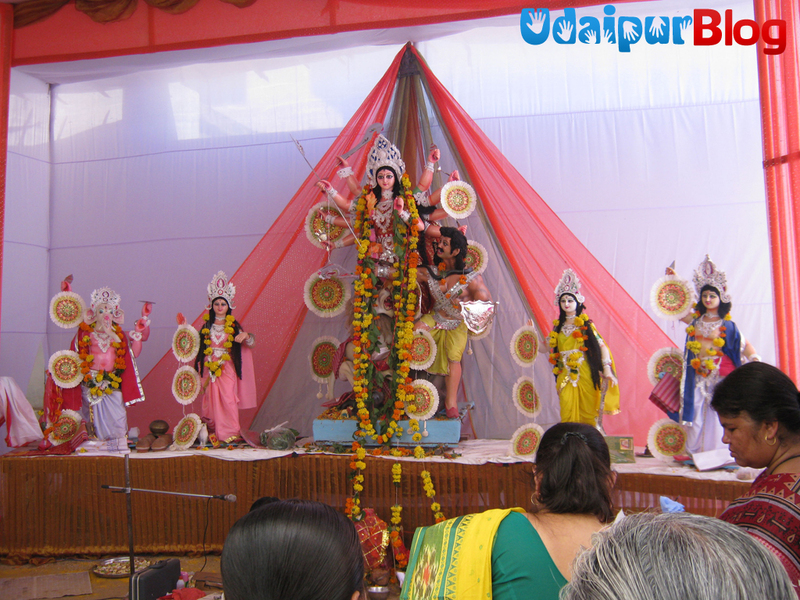 Also the Shyama(Kali) Pooja and Saraswati Pooja on Basant Panchmi are too celebrated at these places. Thanx alot for this info, I personally am highly fascinated by the Goddesses (shak ti swaroop). Loved it! Just wanted to ask whether anyone can come there to witness it? Or is it bound only till Bengalis? hey…m new to udaipur…and i miss kol so mauch…wud lik to make sum bong frnzzz…if ne1 interested pls reply…. Actually I am associated with a Dance Company named “Mitrayan Institute of Dance & Research” and we do perform “Gaudiya Nritya” (Classical Dance of Bengal) and other Bengali Dance forms. This year we are coming to perform our dance in Gujarat during Durga Puja. I have seen that Gujarat is quite reachable from Udaipur (once long back we did the same in 2005), So it will be our grate pleasure to have also a performance @ Udaipur during the Durga Puja. I have tried goggling and facebook to find any sort of contact address of the Bengali Association of Udaipur or the details of the organizers but no such result came out – only I have found your post on this blog. So with no other option I am sending you this message. If you kindly share the contact details (atleast phone number of the concern person) of the organizing committees of Durga Puja of Udaipur then I will be very much thankful to you. Looking forward to you and if any inconvenience is caused is also highly regretted. Myself Aniket Bose. I m from Mumbai.Born n bought u in Mumbai…i m here in udaipur for engineering since 1.5years. i m happy to see dis blog. i dont know any bengali peole in udaipur.i want to make contact wid bengali people of udaipur..i really miss our bengali people….the most i miss here is bengali food and bengali peole..i want to make bengali frnds.meeting bengali people and having bengali food here will really make me happy.